Take the tour... if you dare! This entertaining and informative DVD presentation will sweep you along to places where restless spirits roam, events resist explanation, and mysteries remain unsolved. 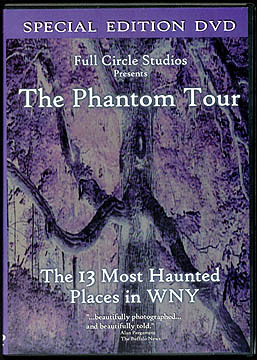 Western New York's foremost authority on the paranormal -- Mason Winfield (A Ghosthunter's Journal, Haunted Places of Western New York) -- is your tour guide for this unsettling yet familiar journey through the region. "...all at once I sensed a presence to my right, and I turned... and there stood this... distinguished-looking gentleman, with a white mustache, and he said to be, `Isn't it magnificent.'... And when I turned back, he was gone. And that was just the matter of an instant..."
"...a group of hikers, lost for almost 24 hours. When they were finally found, they were quoted as following a group of other hikers deeper and deeper into the park, hoping to ask them directions when they caught them. They could never quite catch them. And then, just as they were literally lost, the people vanished." The DVD boasts full-screen and widescreen presentation, a "monster makeover" with David Gray, a behind-the-scenes look at the Haunted Catacombs, and more. Production by Buffalo's own Full Circle Studios. One last note: the photo you see on the cover is not computer art. The color has been altered for dramatic purposes, but that tree with all the menacing "arms" exists. To learn more, see this DVD. It is called the "Torture Tree." "...beautifully photographed... and beautifully told."